Fancy a luxury tipi in the Alps? Star gazing in Italy's mighty Dolomites? Or a late night campfire in the Lake District? When you think of true seclusion, it's often these dramatic landscapes that spring to mind. Yet while, for some, camping in the hills is the very essence of what being outdoors is all about, nowadays you don't have to buy a high-tech tent to travel lightly on the trails. Instead, here are some of our favourite glamping sites in the mountains, so that you can light-foot your way across the hills but still enjoy the utmost luxury and that all important outdoor feel. Browse our selection of 12 glamping sites in the UK and Europe's mountains below, or click here to view all glamping sites in the mountains. 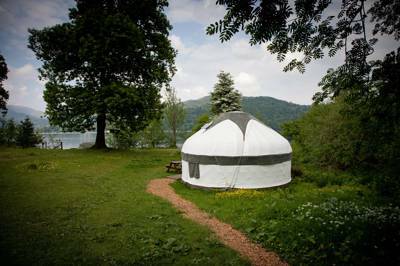 Tucked on the western shore of Windermere, Long Valley Yurts, in the heart of the Lake District is a prime spot for ramblers taking on the fabled landscapes of the national park. In the shadow of Wray Castle, the glamping site is home to yurts sleeping up to five people each, including a fully equipped kitchen, a small onsite shop and a fantastic adventure playground for children. You can also launch canoes and kayaks straight into the lake. Seiser Alm is a review writer's nightmare – impossible to put into words. The surrounding, hulking mountains of the Dolomites offer not only excellent walking and mountain biking, but also a backdrop thats difficult to match anywhere in Europe. Now with innovative, wooden 'eco tents', the site offers cosy glamping for those travelling light. With high floors, tiled roofs and panoramic windows, they fit subtly into the landscape but provide essential mountain comfort. On the banks of the Glaslyn river and set between the twin lakes of Dinas and Gwynant, Red Dragon Holidays is a real outdoorsmen's camp, with five custom-built pods sleeping two a piece. Inside they're equipped with all the basics you could require for a tent-less trekking holiday, but otherwise facilities are functional rather than luxurious. There's a communal kitchenette, a common area (with Wi-Fi and internet access) and a life-saving laundry/drying room. Among the olive groves in the majestic mountains of Região Centro, Portugal Yurt retreat is a wonderfully laid back, secluded site. Accommodation consists of two homemade Mongolian yurts, constructed using wood from the surrounding area and each built on a sturdy wooden base, with an adjoining bathroom and covered outdoor kitchen/dining area. Eco Camel, in the remote Sierra de las Nieves of southern Spain, is defined by its views. Yet the single bell tent, furnished with a king-size bed and plenty of creature comforts, is worth ample praise in it's own right. It's spacious and bright, with lots of storage room for your walking boots, while just outside an en suite wetroom adds to the sense of privacy. Offsite, a visit to nearby Ronda is a must – if you don't mind leaving the pursuits of the mountains that is! On the fringes of the French Alps, Camping La Source is blessed with one of few flat spaces in the area, yet has gargantuan mountains all around. In a section of woodland a trio of tipi's are pitched, furnished with double beds and lanterns to add some twinkling evening light. Whether you’re hiking from one picturesque village to the next or swimming in the local mountain lake, filled with glistening melt-water, you'll find this a safe but luxury choice. From kayaking on Loch Morlich to tackling Britain's highest mountain range, Aviemore glamping, in the northern fringes of the Cairngorms National Park, is a year-round base for outdoor enthusiasts of all persuasions. In the grounds of a charming B&B, the hassle-free site has four ingeniously designed timber pods kitted out with everything you could need, from bedding to cutlery, and an immaculately maintained wet room that's perfect for a post adventure cleanse. The relatively undiscovered Majella National Park is a natural playground, webbed with 500kms of hiking trails and boasting everything from waterfalls to caves. Among it's hillsides, Kokopelli Camping is an easy going site with beautiful bell tents available for hire. The site's modern sanitary facilities and a communal barn offer all the essentials you need, while the adventure-loving owners can organise various outdoor activities in the local area. If you're looking to glamp somewhere a bit different, you can't go wrong with a little morning yoga on the sides of Teide Mountain, the centre point of Canary Island in Tenerife. At 12,198ft it is the highest mountain in Spain, though its distance from mainland Europe makes it a forgotten and undiscovered gem. Comprised of three caves, a renovated ‘Casita’ (cottage) and one lovingly furnished yurt, Elska Organics is a stunning site worthy of its unique setting. On the edge of the White Peak area, Oaker Farm is home to a single shepherd's hut decked out in a chic and strikingly modern style. From the doorstep you can hike up Loose Hill and along the top of a bold ridge to Mam Tor and Kinder Scout, while heading down the valley takes you to a charming local, The Cheshire Cheese Inn. There's underfloor heating, a fitted kitchen and double-glazed glass doors, while Wi-Fi and a TV provide that 21st-century touch. ‘Rustic boutique’ is a good way to describe L’Orri des Planès; a small but perfectly formed campsite nestled atop the Planès Valley. Originally a ruined farmhouse, the site now boasts a 10-room hiking lodge, a clutch of tent pitches and four brand new yurt-style eco-tents with circular wooden floors, futons, pillows and cool-boxes for food. Despite the small-scale, simple feel, there’s plenty to do, including an on-site pool and a hidden stream where kids can play. Chaparra Eco Lodge's spacious and fully insulated yurts come furnished with a comfortable double bed, pillows, blankets, furniture, and halogen lamp lights; but what sets them apart are the astonishing views across the Mediterranean. Despite being reached through a maze of fruit and nut trees, each are graced with an open viewing space and your own private terrace. When you decide to venture out, the traditional spa town of Lanjaron is right on your doorstep.